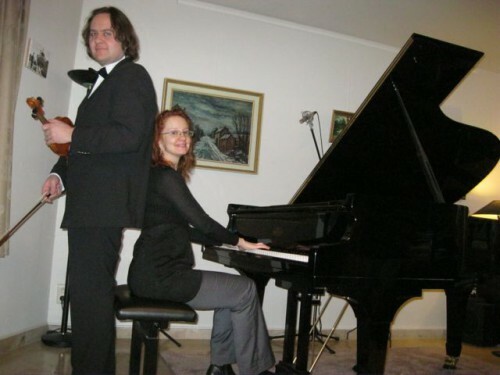 Duo Spirito Crea Maastricht, provides performances and occasional music violin and piano in Netherlands, Belgium and Germany, and in a radius of 100 km around Maastricht. Duo Spirito Crea, consisting of violinist Dennis Wijntjens and pianist Vera Melnichenko, musical partners for a long time, making it perfect attuned. Despite our classical training, we feel at home in Jazz, Rock, Pop en Show repertoire. We have a digital piano we can take with us. A digital piano or stage piano is sonically similar to a Grand Piano and is not a keyboard. We can amplify the digital piano and the acoustic violin a bit .. It is of course also possible to play on a present piano, Grand Piano or in church on a church organ ,, provided that they are in good condition and tuned properly. For small rooms inside we can (if necessary) use a small amplifier. For bigger rooms and for outside we make use of a sound system (PA), consisting of two speakers on a stand and a bass speaker. We need a minimum setup time , 45 minutes. Chamber Music Concerts, Receptions and mood music, (wedding)miss and Ceremonies, Accompaniments and help out, Studio work and sound recordings, Theme performances. 1 hour, 2 hour or 3 hour, unless otherwise stated. See also our example playlists with possible pieces. You can also reference tones listen to. Some program proposals Violin and Piano are supplemented or alternated with a Violin solo live with backing-tracks. This is a live violin solo with a accompaniment on orchestra band (combo, band, orchestra). We also act as Musicato, this is a dazzling show with classical and contemporary live violin and piano music supported with video and images on a large projection screen. Check out the experiences of visitors to our performances. for the wonderful violin play at our wedding ! thanks, it was the best day of our lives! It's been a few months ago, but we still want you to thank for the musical care during our wedding mass in the Basilica of St. Servatius and then our reception on 3 mei j.l. in Chateau Neercanne. We look back on a wonderful wedding mass and we found the music very beautiful. We have regular compliments from several guests about the wonderful musical performance. We were very pleased and happy with our choice to take care of you through the music. If we ever again Maastricht again throw a party, then we will certainly think of you! The music was really off! Thanks a lot to do with it such a beautiful celebration. We were unable to better imagine! There are great many compliments come from the people who were present on the pretty music! So, once a heartfelt thank you for all the effort that had to stabbing you in it, but it was really fantastic! valentine from 14-02-2010 the surprise was a true "Discover the star contest" ! "With such beautiful music you dare not dance"
VERA & DENNIS very many thanks! You can below comments leave our gigs. Comments and photos you can also share with our Facebook page or email us. thanks in advance.